Husky dog training can be a completely unexpected experience for those who are new to or inexperienced with Huskies. It is completely different from training other types of dogs. Huskies are definitely not like Golden Retrievers – that is, they aren’t pushovers when it comes to doing what you tell them to. They are very stubborn and are independent thinkers by nature. If your Husky doesn’t see you as the leader of the “pack,” he will not see a reason to obey you. To prevent behavioral issues from forming, training should start from day one. Husky dog training is most effective if it is begun when your dog is still a puppy. Do establish house rules early on and make sure your puppy understands that you are in charge. Therefore, if you train your Husky to do something, then expect him to do it every time. Doing this will make your Husky respect you more and the training will be a lot easier when he reaches adulthood. Husky dog training starts with providing sufficient exercise. Since Huskies do have a strong desire to run in their genes, you must give them adequate daily exercise as well as a few good runs per week. When given opportunities to vent their energy, Huskies will be far less likely to become destructive or develop bad behaviors. Bored Huskies can be extremely destructive and will do anything from chewing through dry wall to digging craters in your yard. Huskies are a breed that responds well in particular to positive reinforcement. Avoid harshly punishing your Husky both verbally or physically as doing so will cause him to lose his trust in you and ignore your commands. 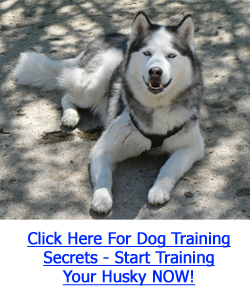 Click Here For Dog Training Secrets – Start Training Your Husky TODAY! In order to obedience train your Husky effectively, you need to be confident and just as strong-willed and stubborn as him. Effective Husky dog training starts with your Husky seeing you as the leader of the pack and respecting you as such. Despite centuries of breeding, your Husky still thinks of his family as a pack and needs to know his place in the hierarchy. Be consistent and stick to any rules that you set. For example, you don’t want to kick him off the couch one day and then allow him on it the next. That will only confuse him and will render the training ineffective. Once you’ve decided on a phrase for a command, stick to it. Enrolling in an obedience class is a very good idea for both you and your Husky. Because Huskies can be difficult to train, you will want any extra help you can get. However if you have the patience and effort to train your Husky well, he will become a wonderful family pet.